It's finished! 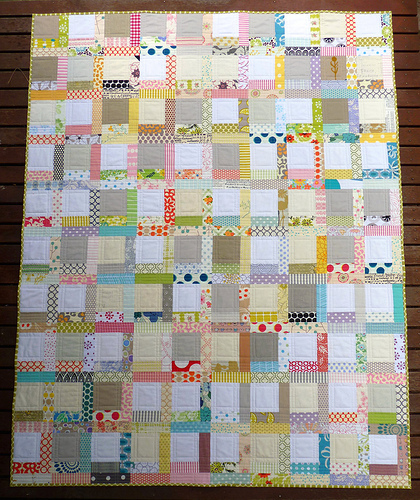 And I am ever so pleased with this quilt; it is calming and subtle, and also fresh and modern. I've enjoyed piecing this simple design ~ once you get your fabrics organized the blocks can be chain pieced and before you know it you've got yourself a finished quilt top. The quilting has added another dimension to the quilt top. It has given the quilt texture; turning layers of fabric and batting into a comforting blanket with beautiful drape. Straight line quilting may well be more time consuming, but I think it is worth the effort for the effect that it creates. 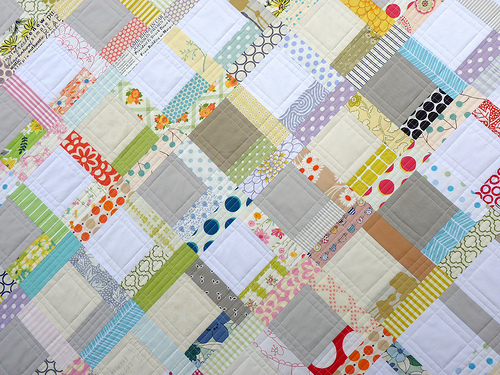 The grids of intersection lines all add to the finished look and feel of this quilt. The binding fabric is one of my favorite - there are many favorites! 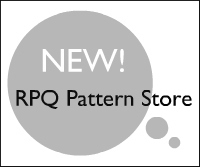 - fabrics that I like to use to frame a quilt. This is Full Moon Polka Dot in Lime by Amy Butler. Initially I had selected the same fabric in Cherry Red, but at the last minute decided that the contrast would be too harsh for this gently colored quilt. It is usually at this point that I tell you that you can find this quilt listed in my Etsy Store, however it was snapped up moments after listing. The good news is that I have written a pattern for the Tiffany Quilt and indeed the pattern is available for sale in my Etsy Store. The listing for the Tiffany Quilt Pattern can be found here and is available for immediate download. 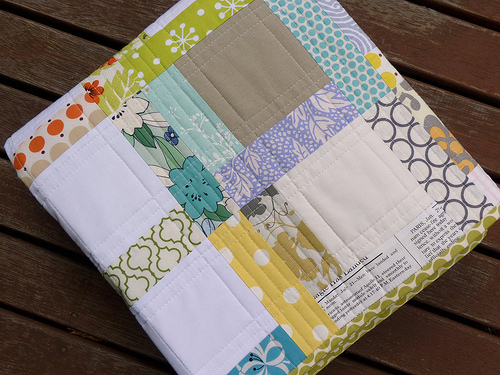 It is wonderful Rita, fantastic mix of fabrics and the quilting is just perfect for it. Rita, this is such a beautiful quilt! Calming yet modern - you pegged it!! Lovely, the pattern & colours. Very pretty! I really like the way the fabrics work together. What did you use for the backing? No wonder it was snatched up already - it's just lovely! It's beautiful! I think you are right- the straight line quilting serves this quilt well. As always, your designs are simple yet stunning! The mix of neutrals of wonderful! Love the way it turned out with the contrasting neutral colors as the centers of each block. Wish I could lay down underneeth it. What a beautiful quilt. So spring, so fresh. Well done. What a wonderful quilt, the mix of neutrals with the geometrical fabrics is stupendous and the quilting is just perfect for it. I love how you usually reflect the front pattern on the back. Did you not do it this time? I missed a picture from the back, which are usually so lovely and creative. Oh Rita, I LOVE this one!!! I know, and you sure know too that all your quilts are incredible. And everytime I take a look at your blog I fell sooo inspired. But this one... Hmmm... this one is so...soft ... and cozy... and nice and ... you just wanna have it in your home. I think this is a quilt that makes both modern and traditional quilters go awwwwww. Great, fresh quilt! And I'm so glad there's a pattern! Definitely one to add to the list. This was one of the last things I saw last night before bed, so I ended up dreaming that as a result of your great scrap packs, you ended up designing fabric and had a limited release of cheater prints available, so we'd all have a variety of prints for this quilt and more. 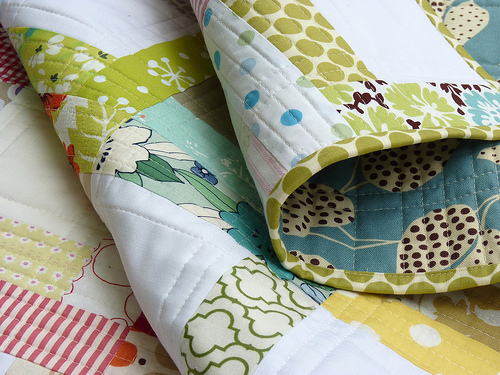 It's no surprise this quilt didn't last long in your shop - its beautiful! I really love its subtle tones and colors, so beautiful! wow, wow, wow....this is so beautiful!!! I love it. loves how the simplicity is soothing. excellent fabric selection for this effect. very nice! The simplicity of the quilt really makes it beautiful! The quilt looks GREAT! Very good call on using the green binding, not the red. I agree; it is quietly graphic. Very calming and very pretty. 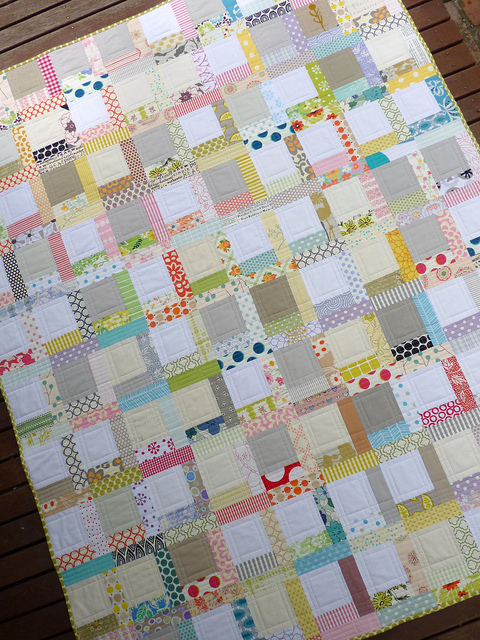 I love the quilt, I have lots of Liberty scraps which I think would be great.What colour thread have you used to quilt ? love the low volume feel of this quilt!! stunning. Beautiful! This could very well be the first quilt I ever make with a pattern! Love the quilt. How long did it take you to make it? This quilt is stunning. I absolutely love the calming colours. Really really fantastic job!